1) INS Chakra is a Russia-made, nuclear-propelled, hunter-killer submarine. Unlike conventional submarines that India operates which need to surface to charge its battery’s often – sometimes as frequently as 24 hours – INS Chakra can stay under as long as it wants. Its ability to stay underwater is restrained only by human endurance to stay underwater. Also, another problem that the submarine could face is acidity. This is because of a lack of exercise inside due to prolonged deployments. 2) The Akula Class submarine will carry conventional weapons. The vessel is armed with four 533mm torpedo tubes and four 650mm torpedo tubes. It will be used to hunt and kill enemy ships. 3) The INS Chakra displaces about 10,000 tons. It can do over 30 knots – more than twice the speed of conventional submarines. It can go upto a depth of 600 metres. 4) INS Chakra is one of the quietest nuclear submarines around, with noise levels next to zero. 5) It has about 80 crew members on board. The entire crew of INS Chakra has been trained in Russia for over a year. Facilities for the crew on board INS Chakra include a large recreation area, a gymnasium and a sauna as well. 6) INS Chakra has been taken on lease from Russia for 10 years and would provide the Navy the opportunity to train personnel and operate such nuclear-powered vessels. In 2004, India had signed a deal with Russia worth over $900 million for leasing the submarine. 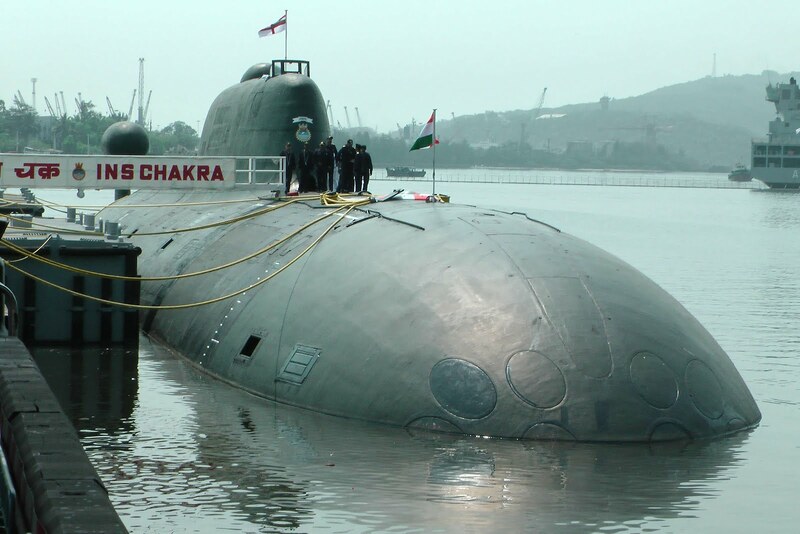 INS Chakra was expected to be inducted into Indian Navy a couple of years ago, but after an on-board accident in 2008, in which several Russian sailors died, the delivery schedule was changed. 8) The induction of the nuclear-powered submarine clearly indicates India’s intentions in the Indian Ocean Region and South East Asia which has recently seen increasing assertive Chinese presence in the last few months. It will also a send a strong reassuring message to south east Asian nations like Indonesia, Vietnam and Malaysia who want India to play a more active role in the region to counter the assertiveness of China in the area. 9) The induction of the INS Chakra is likely to be followed by the induction of the indigenous INS Arihant, which will be capable of launching nuclear weapons and therefore complete the nuclear triad. INS Arihant, it is understood, is now undergoing sea trails at Vizag. 10) The only other nations possessing nuclear-powered submarines are – US, Russia, UK, France and China. India is back in this elite club after over a decade. In 1988, the Indian Navy had leased a Charlie Class nuclear-powered submarine for three years till 1991. However, the expertise gathered then was lost as most officers who had trained to operate nuclear submarines have retired.